Snook is a white-meat fish with a tasty, flaky flesh. It's illegal to buy or sell snook, but you can catch and cook the fish legally. Snook is a lean, healthy protein that makes a great centerpiece for a low-fat seafood-based meal. Snook fillets cook quickly on the grill or blackened in a hot pan. By grilling or blackening the fish, you give it an excellent smokey or spicy flavor without adding too much extra fat or calories to the meal. Preheat a gas or charcoal grill to high heat. Check that the internal temperature of the grill reaches 600 degrees Fahrenheit. Try the hand test to see if the grill is hot enough. You should be able to hold your hand over the grill for only one to three seconds when the temperature is right. Use a pastry brush to paint all sides of the snook fillets with a small amount of a healthy oil, such as olive oil. Sprinkle the fish with a small amount of salt and pepper. Paint a small amount of oil on the hot grill grates to keep the fish from sticking. Place the snook fillets on the hot grill and cook for three to four minutes per side. 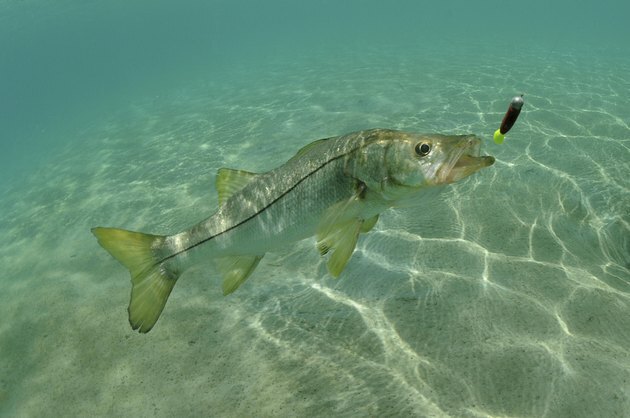 Check with a fork that the inside of the snook is opaque and flaky. Remove the fish from the grill and place it on a serving platter. Serve the snook hot with a homemade salsa on top, which is healthier than an oil-based sauce. Sprinkle blackening spices on both sides of a snook fillet, pressing the spices into the fish. Make your own blackening mix to avoid the excess salt and preservatives in commercial blackening mixes. Heat a cast-iron skillet on the stove top over high heat. Heat a very small amount of a healthy oil, such as organic canola oil, in the skillet. Cut back on your fat intake even further by using a small amount of spray oil. Place the snook in the hot pan. Cook until the outsides of the fish are golden brown, about two minutes per side. Slide the skillet into the oven and finish cooking the snook. Remove the fish from the oven when the outside of the fish has turned black and is almost burnt. Serve the fish warm with lemon wedges for drizzling. Blackened fish is traditionally served with tartar sauce. Make a homemade healthier version by combining low-fat mayonnaise with chopped pickles. Combine salt, pepper, paprika, garlic powder and cayenne for a tasty homemade blackening spice.